Instead, Samsung is spotlighting new Android and Windows tablets after delaying the Galaxy S8 smartphone - an indirect casualty of the unprecedented September recall of the fire-prone Note 7 phone . The new tablets will carry the Galaxy brand and come with many of the Note 7's features, including the S Pen stylus and screens with rich colors. Consumers will have to wait at least a few weeks longer for details on Samsung's next major smartphone. That's partly so that Samsung wouldn't have to share the stage with its smartphone rivals at the Mobile World Congress trade show, which begins Monday in Barcelona, Spain. The delay also gives Samsung more time to make sure it has done everything right, given that any minor bug will surely draw outsized attention. "The microscope is going to be firmly on Samsung," said Geoff Blaber, an analyst with the research firm CCS Insight. 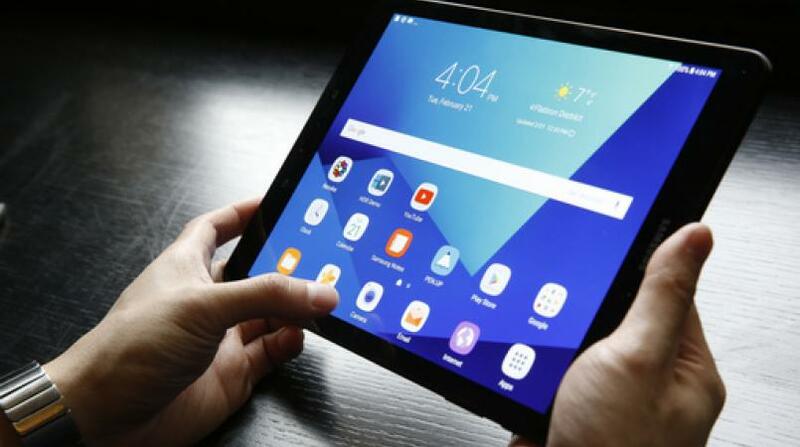 Samsung said the new tablets will go through extensive safety checks put in place after dozens of Note 7 phone overheated and in some cases exploded. Those incidents prompted aviation authorities to ban them on flights; Samsung eventually killed the product. - The new Galaxy Tab S3, running Google's Android system, will have a glass back and metal frame, borrowing designs from Samsung's smartphones. The screen technology, called AMOLED, offers richer colors and purer blacks than standard LCD screens. The display will support high-dynamic range, a feature that promises brighter whites, darker blacks and a wider range of colors - at least for the handful of video titles produced with that capability. - For those wanting a laptop replacement , Samsung is releasing the Galaxy Book with Microsoft's Windows 10 and more powerful processors from Intel. Only the 12-inch version will get AMOLED, though; the 10-inch Galaxy Book will use LCD. Both models come with a keyboard attachment, something sold as an optional accessory for the S3. The Galaxy Book is Samsung's answer to Apple's iPad Pro and Microsoft's Surface devices. All models come with Samsung's S Pen and include standard features from the Note phones, such as taking on-screen notes when the phone is locked. But unlike the Note, these tablets lack spring-loaded cavities for storing the stylus. Prices and release dates haven't been announced. Samsung also said that its Gear VR virtual-reality headset will now come with a hand-held controller, matching Google's Daydream View offering. The absence of a new Samsung phone gives rivals a chance to shine. LG, for instance, is pushing a G6 phone that is slightly smaller than the Note 7 but matches the doomed phone's 5.7-inch screen size. LG is also matching major rivals in offering water and dust resistance, though in doing so, it got rid of an ability to replace the battery with a spare - a feature LG had long cited to set itself apart from rivals. LG also redesigned the insides to separate the two main sources of heat - the main processor and the display driver - while doubling the separation between the battery's positive and negative chambers. The fact that these under-the-hood improvements are getting any mention at all shows the climate all phone makers are navigating after the Note 7 fires. Meanwhile, Motorola has a new version of its mid-range Moto G phone, while Chinese smartphone maker TCL is unveiling a BlackBerry Android phone with a physical keyboard after BlackBerry gave up on making hardware itself. And the classic Nokia 3310 phone from the year 2000 is coming back; although it's not a smartphone, the device is popular for its durability. It'll be tough, though, for any company to stand out as innovation in smartphones slows down. The challenges are underscored by the fact that only Apple appears to have benefited from Samsung's troubles. According to research firm IDC, worldwide iPhone shipments grew 5 percent in the fourth quarter, compared with the previous year. That's about the same as what Samsung lost. Even after the Note 7 recall, many consumers decided to stay with Samsung, analysts say. Switching to the iPhone means learning a new operating system and buying new apps, while Google couldn't produce enough of a promising Android contender, the Pixel, to meet demand. Samsung took a $5.3 billion hit on its earnings in recalling millions of Note 7 phones. Its reputation also took a hit - but not necessarily permanently. "In the process of addressing the situation, I think Samsung buys back some of the good will with consumers," said Ramon Llamas, an analyst with IDC. "What people want is an assurance that it doesn't happen again." This could mean being more conservative in the S8 features, though it also needs some breakout features to restore excitement in the brand. Llamas said that could come through software features, such as S Voice, a voice assistant rivaling Apple's Siri, or Samsung Flow, a way for multiple devices to work together. The new tablets will come with Samsung Flow so that you can make phone calls and answer texts using the tablet as a bridge to a phone sitting on the table or in your pocket. Blaber said Samsung was smart in delaying the launch of the S8, as it needs a smooth rollout to recover.